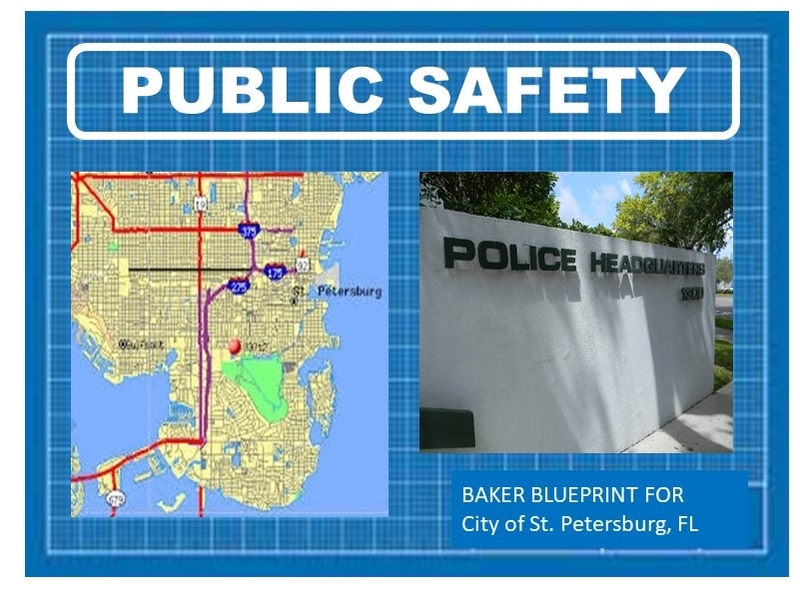 Public safety is THE number one job of any mayor in any city in the United States. 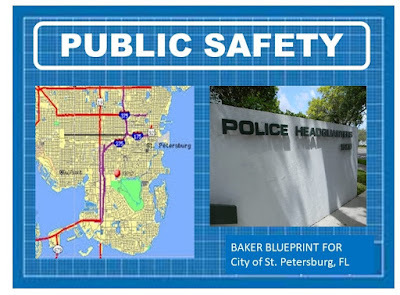 For more than eight years as Mayor, Rick Baker worked to transform St. Petersburg into a modern, prosperous, safe, neighborhood- friendly and seamless city. From jobs and economic empowerment, to schools, neighborhoods, the arts, our environment, and public safety, this “blueprint” will guide Rick Baker’s efforts to restore competence, commitment and honesty to City Hall. OFFICERS: We must ensure we have an adequate number of well-trained, well-equipped and highly motivated officers who are respected by everyone in a very diverse city. EMERGENCY OPERATIONS: Hurricane Irma was the most recent reminder that where we live is both beautiful and vulnerable. I will work closely with St Pete’s Police and Fire Chiefs to make sure we are extremely prepared to respond before AND after the storm, with updated contingency plans and backed by a revolving committee that each season will review and assess our responses to both natural and man-made crises. AUTO THEFT: NO ONE should go to bed at night wondering if their car will be there in the morning, and yet we’ve seen a sharp increase in auto thefts. On my first day I will work with Chief Holloway to reestablish an Auto Theft Unit eliminated by the current mayor, and to make this crime a renewed focus in and beyond the Police Department. STREET CRIMES: Many of our neighbors both north and south are forced to co-exist with street crimes, like increased drug dealing and prostitution, often in view of their children. Just like auto thefts, I will reinstitute a Street Crimes Unit that for some reason was mothballed by the current mayor. OPIOIDS: Too many of our citizens lose loved ones to the misuse and overuse of opioids, a local problem that’s part of a national epidemic. We will work overtime, in cooperation with law enforcement and substance abuse organizations to expand education and treatment while putting those responsible for this on notice that we will have zero tolerance for their role in promoting it. A positive example of partnering in the drug rehabilitation area is the Davis-Bradley center in Midtown – we worked during my term to get the operating funding from the state and Westcare presently operates the facility. NEIGHBORHOOD POLICING: In meetings with the Chief, his staff, and neighborhood leaders we will seek ways to implement improvements in neighborhood policing that delivers some peace of mind to people and families concerned about crime closest to where they live. MIDTOWN STATS: We can only address crime in Midtown, and elsewhere, with timely and accurate reporting of crime statistics, an approach that has been rejected by our current mayor. There’s been a recent, significant crime spike in Midtown, and I will call for separate measurement of crime there so we can better identify it, deal with it, and eliminate it. Our current mayor has stopped tracking and reporting crime in Midtown. MURDER: Why is it that the number of murders have almost doubled, from 11 during my last year in office to 20 murders under Mr. Kriseman last year? Violence begets violence, and we will work without rest to stop the killings – law enforcement, education and jobs for youth have a role in this and all crime. TRANSPARENCY, ACCOUNTABILITY & DIALOGUE: I will establish accurate, transparent reporting practices to ensure resources are allocated to the greatest areas of need. I will immediately begin the expansion of dash cams for our police cars; study the reasons behind the dramatic reduction of citizens’ complaints being reported by the police department; and begin a dialogue with the police, City Council and citizens over the continued expansion of dash cams and the suggested use of body cams. Has the Florida Aquifer become Kriseman’s toilet? Have you sent in Your Mail in Ballot? Climate Change – How Serious is Rick Kriseman? Deputy Mayor Tomalin – profiled or over reacting?